Confession time: I’m a library junkie. Related confession: I use my library shamelessly like a “try before you buy” service. I order online and have other libraries send my branch all the latest (and oldest) popular pattern books, stitch books, and technique books. Why, back when I was doing the Master Knitter Level I, I ordered the original June Hemmons Hyatt Principles of Knitting, and was able to renew it for months on end… and this was back when it was out of print and it’s secondary market value was inflated to $300+! I’m not exaggerating when I say that I voraciously preview crafting books from the library. So far, I haven’t done much to review the hundred or so craft books that pass through my hands every year. Most don’t intrigue me enough to pursue past flipping through the patterns. But today I’m going to give a review, simply because the book I found was such an interesting oddity. During a recent rare browsing visit to the library (usually I just pick up my holds and dash), I found a book called The Knitter’s Life List. As far as I know, a “life list” is a term from birding, in which the birder has a list of all the birds in a region, maybe listing rarity, and checks them off as they are observed in the wild. I think it’s kind of a self-competition thing, a goal to try to catch a glimpse of the “rare whosiwhatsit bird”, and it also provides hobbyists with a point of reference when conversing with one another. I think I went on a field trip as a kid where we were given life lists to inspire us to search the area carefully and quietly for wildlife. And inspiration is certainly the point of The Knitter’s Life List. The book is chock full of entertaining tidbits about our knitting hobby, the “who’s who”, and what this author feels are the big accomplishments. The book’s chapters are organized by categories such as yarns, fibers, techniques, and types of commonly knitted objects such as scarves. In the beginning of each chapter, there is a “life list” for the category which is subdivided into categories such as who to meet related to the category, resources to discover, knitting techniques to try or learn, and maybe other sub-categories like places to visit or “extra credit” questions. Reading the rest of the following chapter will help explain some of the items on the life list, which give you a sense of being lead through a lesson. On the whole, this is a fun book to get from the library. There are lots of odd little facts, quotes from the luminaries of the current knitting world, tips and tricks, bits of history, and lists of movies or books that contain some knitting homage. It’s fun to flip around and discover something new. There are one-page biographies too, that offer a little more insight into some of our favorite knitters: for example, Barbara Walker who is famous in our industry for creating some really great reference books of stitch patterns, is also an award winning author in comparative religion and a painter. It’s nice to have a little more insight about an knitting author than the back of a book jacket might provide. The life lists themselves have challenging and intriguing tasks and accomplishments, even for a moderately advanced knitter such as myself. Almost every crafter ever has some area that they are more accomplished in than another. Let’s take a look at a few from the socks section, as I’ve only ever knit about a half-dozen pairs: “Make two socks at once on one circular needle” – done, but didn’t like it. “Knit a sock using double-point needles” – done, definitely my preferred method. “Knit a toe-up sock” – you know, I don’t think I actually ever tried this! Don’t revoke my knitter’s license now! “Knit and donate a historic Red Cross pattern.” – well, now, that’s a really cool idea that I would never have thought of! There’s a good page and a half more to the sock list, as well as blank spaces for your own ideas. So the lists are pretty cool, and a fun idea if you like to challenge yourself to try new things in the world of knitting. And the rest of the chapter between each of the lists is fun and enjoyable, in kind of a knitter’s Mental Floss way. And yet, I wouldn’t really want to own this book. There are a few reasons why. First, I don’t enjoy writing in books. Obviously, I didn’t write in the library’s book! But in general, I dislike the concept of writing in a book like this. It feels like a regular, bound book, with semi-glossy pages, and the kind of book one is not supposed to write in. I don’t even think the page texture will take a mark very well, and would probably get kind of smeary if you used pen. Although again, library book – I didn’t actually try. If it was spiral bound or something though, and they had the list section with a different page texture, maybe I would feel more “invited” to write. Semi-glossy, soft-bound, 320 page books do not feel like an inviting medium in which to work on a list. Then let’s talk about this layout a bit. While I’m skimming along through the chapters, it is nice that there is a list and then information that explains the stuff on the list, but this isn’t a great layout for returning to reference a specific fact or list. I’m not going to flip through an entire book every time I want to see if I’ve accomplished something I can check off. A discrete list, reprinted at the back might solve the problem. Better yet, a discrete list reprinted at the back with perforations so I can tear out the list and carry it around in my knitting bag might be better. Or even maybe, like the textbooks do it, a one-time use code that leads me to a code-locked website where I can download and print a personal copy. Or a downloadable PDF I can keep on my phone for reference when I’m at a class or guild meeting. But no, it’s like this book invites you to enjoy it’s list and then mocks you for wanting to check things off. Indulge my hyperbole, if you would please, it’s fun to pretend to be a book critic for a moment. So, I’m not running out to buy my own copy, but I did find The Knitter’s Life List to be inspiring and entertaining. If you see it at the library, check it out! And I think I’ll use it as a jumping off point to create my own “life list” of crafting accomplishments and techniques I want to learn as a challenge to myself. But, I think for mine, I’m going to use Wunderlist or something, so that I can carry my list around wherever I go. Digital is a very good medium for lists. What about you? Do you have a list of knitting accomplishments that you want to try or master? Would you keep a list for yourself to challenge yourself, or would you rather learn new things as they come up in service of a particular pattern or class? For the second time, I have had the delightful opportunity to attend a workshop in Youngstown, Ohio called “A Knitter’s Fantasy”. 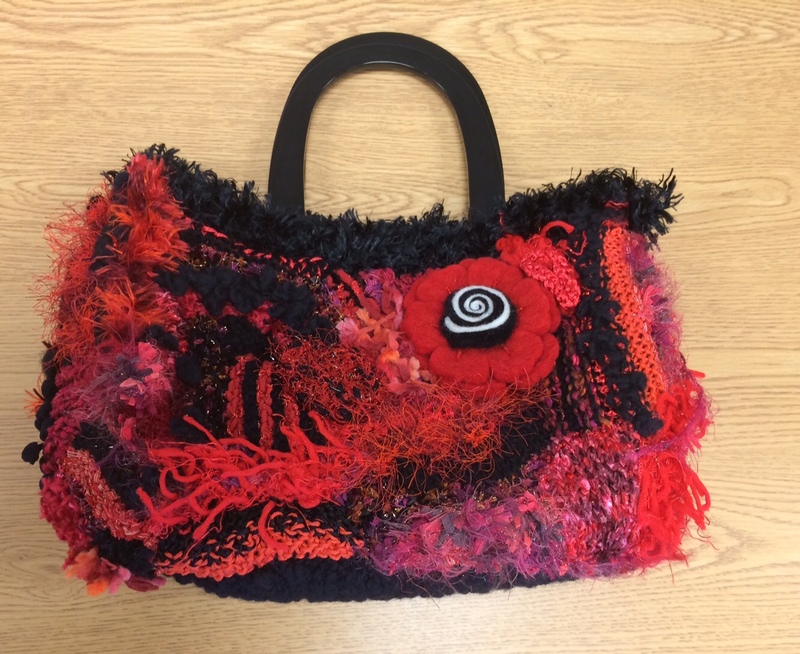 The workshop has, in the past, been run as a rotation among three Ohio knitting guilds. I understand however that the event has become too much work for one of the guilds involved, and it may no longer occur at all in future years. It is too bad, because it is a wonderful event for attendees, although I can’t imagine the amount of work that is probably put on a few individuals from each guild. The format of the workshop is what makes it really amazing, it’s like a mini-convention or expo (comparing to my other niche-hobby frames of reference: boardgaming and quilting). For $45 (this year), you get admission to a charming “Yarn Market” of about 20 or so vendors, access to a morning class and an afternoon class, and a lunch. There is also a fashion show at lunch, door prizes, a “swap” table where knitters can destash and other knitters can pick up free yarn, tools and patterns, and, for the two years that I have attended, there has also been a demonstration room for machine knitting hosted by a machine-knitting guild. The classes themselves are what really make this event great. As far as I understand, all of the teachers are volunteering their time. The cost of attendance is included in the $45, but some classes cost an additional small fee for materials or extensive hand-outs. I find the quality of teaching and/or expertise of the teacher has varied widely, but all the classes have still been a lot of fun. One year, for example, I took Tunisian crochet and the intended teacher had gotten sick, so two very enthusiastic volunteers learned the skill the night before, printed lots of handouts, and ran a great class! It was tough for them to answer questions of any depth, however, I really felt that they made the class fun and I did successfully learn the basic Tunisian crochet pattern. Her written knitted broomstick lace pattern actually makes a little more sense than the version I was given in the class, which caused a lot of confusion for myself and other class participants. Luckily, the teacher was able to straighten us out. The Freeform Knitting class was really my favorite of this year. The teacher, Sandy Hardy, was enthusiastic and very knowledgeable. Someone had volunteered a load of plain and novelty yarns, and everyone was encouraged to bring in yarns to share as well. This is the first time I’ve seen novelty yarns really go to an amazing and versatile use! Usually, I think of “novelty yarns” as the uni-taskers of the yarn world – they might do one thing really well, but you’re probably not going to want an every-day sweater out of it, and the appeal of the item you make might be limited to just a year or two before the look is out of style. Normally I approach novelty yarns with extreme caution, but after this exciting class I’m wondering where I can get a grab-bag or someone’s destash! Sandy began the class by trying to establish a relaxing atmosphere for creative exploration of a knitting form that is really versatile. 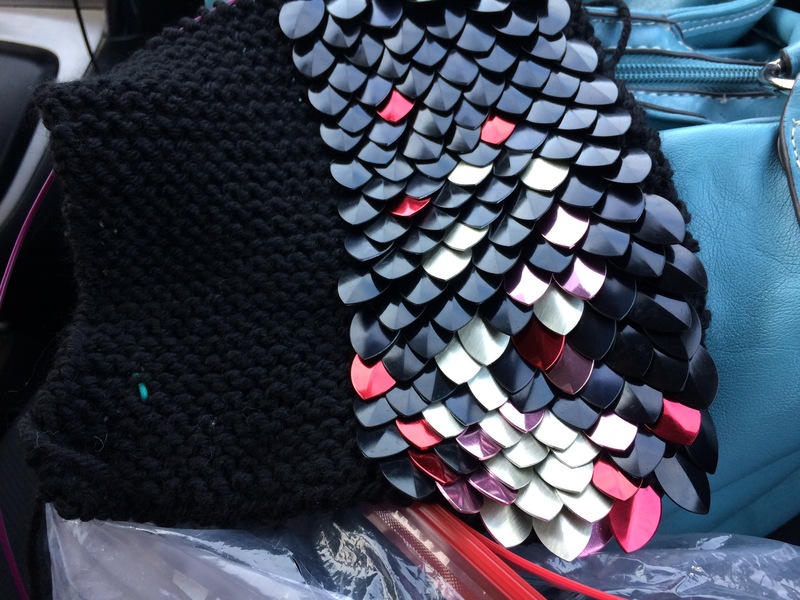 She then encouraged all the students to grab yarns from the share table, and gently pushed students with more subdued palettes to add in bits of yarn with more sparkle and contrasting color. We received a handout with lots of resources as well as a few basic stitches, and she coached us through starting a mitered or garter block as a foundation, and then picking up stitches to make small units that could be pieced together later for handbags or other items. Sandy had the most amazing example piece that she had created. She used a purse-form from a local yarn store (River Color Studio, which is my favorite yarn store, in Lakewood, OH, just sadly not very local to me anymore), but mentioned that plastic needlepoint canvas should work as well as a stabilizer and foundation to sew on the modular units. I did admire the purse-form she had, as it was more flexible than rigid plastic canvas, however, I haven’t found the exact same thing online yet. [Update: Sandy emailed me a link to the Lacis catalog, search TM22 to find the plastic mesh frame she used in her example.] I think I might do ok with buckram (a stiffened linen) for my purposes. 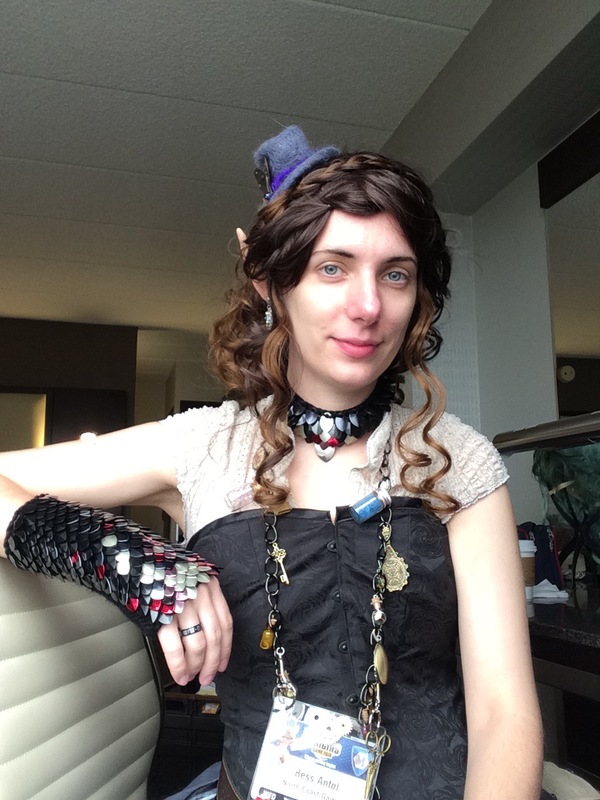 From the resources in Sandy’s handouts, and the books she passed around, it seems like one of the luminaries of the freeform knitting arena is Prudence Mapstone. 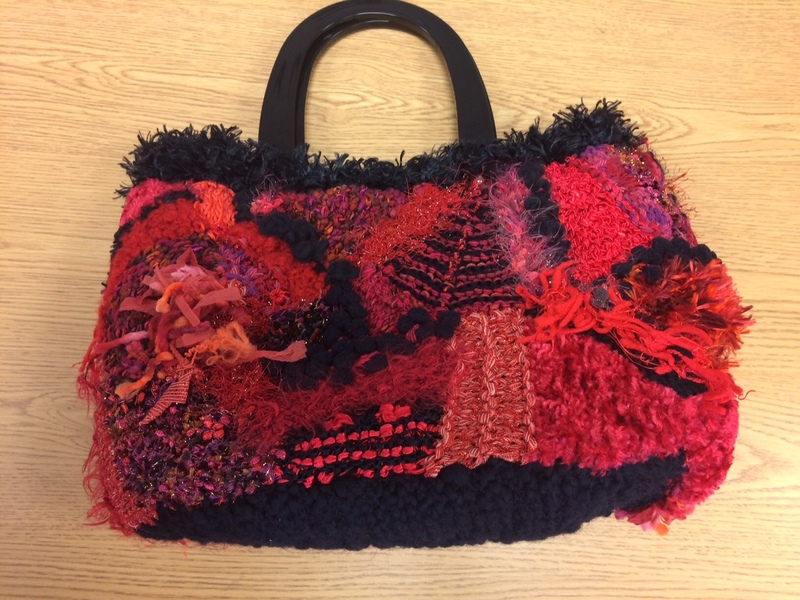 Check out Ms. Mapstone’s inspiring freeform knitting gallery! To add to the spirit of adventure, Sandy walked around the room and dropped small crocheted buttons or contrasting bits of yarn on the students’ desks and encouraged them to figure out how to add these extra bits. I was very impressed by how she really got everyone to move beyond their comfort zones, and I found it quite liberating myself to stop thinking about pattern or count, and just pickup and add stitches, decrease and increase willy-nilly! Just one more testament to Sandy’s skill as a teacher: in addition to teaching veteran knitters, there were actually two brand-new beginning knitters that had just learned to knit in a morning class and she coached them with equal finesse in the art of freeform knitting. I think I remember that the brief teacher bios said that Sandy holds a TKGA educator certificate of some kind. I’ll have to find out more about this, as I would like to try my hand at teaching again some day after I’ve gotten a little farther in the Master Knitter program. The final dose of inspiration in the freeform knitting class was that one of the students happened to have a needle-felted handbag, which prompted a lot of discussion about the possibilities of needle felting by machine (either dedicated machines or with a needle-felting attachment to a regular sewing machine). Thinking about this in context with freeform knitting had me visualizing all kinds of fun hybrid pieces with knit, crocheted, needle-felted, and sewn embellishments. My mind has been whirling ever since! I hope I can capitalize on this momentum and have a great project or two to share in the next few months! Let me start this story by explaining that typically, I am not much of a “Type A” knitter, especially if it’s something I’m knitting for myself. If there’s a mistake, I’ll think of ways to correct it as I go along, or see if it can be ignored. I embrace the wabi-sabi, let go of ego, accept that the screwy details are rarely noticeable when the whole is good, etc. There is a very old “meme” if you will, one that predates the intertubes – it’s about humility. I had heard that it was from quiltmakers, but googling implies that it’s just a story fondly embraced by crafters the world over. The story goes that great quiltmakers (or Persian rugmakers, or Native American beadworkers, etc) would intentionally introduce one flaw into their nearly perfect work as a sign of humility because only God’s (or gods’, or Great Spirit’s, etc) work could be perfect. I have always joked that I never need to worry about spiting the gods with my excessive perfection, because my work is full of mistakes, but if the gods are equally concerned over excessive mistakes, I might be in trouble. This time, however, the mistake demanded instant frogging. This one was too big to finagle my way through with stitch witchery. So what did I screw up? I’ll do a full review of my first Craftsy class experience later, after I’ve completed more of the class, but here’s a quick sum up of the Crazy Lace Cardigan class I have started taking: Great class, terrific hand-outs, engaging teacher, but having some issues with their mobile site. On the mobile site, you can’t (currently) fast-forward, skip ahead, or otherwise navigate through the different “lessons” in a single video. The class as a whole is divided into 14 videos, but some of them are over an hour. My lunch break is only 1hr, and that includes procuring and eating food. I want to do Craftsy class on my lunch break. This has all conspired to make me impatient with the classes on occasion. Its not that the classes are poorly paced either, it’s just that the class is meant to teach a broad range of experience levels, and sometimes they go on for a few minutes about stuff I already know, and on my tablet I can’t skip ahead. But you know what is awesome? When I sent tech support a message to let them know I’d like to see them improve that aspect, they told me they already had mobile apps in the works and ready to release in a few weeks! So hooray for Craftsy! I can’t wait to see if this new app addresses my issues! So that brings me to my problem with the knitting. I was heading to a fun craft night with one good friend and a bunch of gals I hadn’t yet met, and I was debating what project to bring. I wanted something that would really keep my attention, in case I was out of the social loop, but nothing that would look too rarefied because I didn’t want to weird anybody out on the first meeting. So to prepare, I skipped ahead a little on the Craftsy class. That’s where the Big Mistake came in. I reviewed the cast-on, and then grabbed the pattern and did a quick scan to see if there were any techniques I needed to know. Rather than watch that section of the video, I just grabbed a good stitch reference book and headed out the door. It looked pretty good, and I was cruising along feeling that this was a very pleasant pattern and that I would be done with the top yoke part in no time. Today at lunch, I noticed a couple of small mistakes. A missed increase, and an extra yarn-over. But maybe it would all come out in the wash, so I counted some stitches… that’s when i noticed that the increase sections on the two front points of the v-neck didn’t look symmetrical. Uh-oh! I started catching up with the Craftsy video… there it is, there are supposed to be double yarn-overs at every marker. If you look at the image above, you will note that there are only single yarn-overs. But here’s the kicker… the pattern is not wrong. The video would have helped me not make the mistake by carefully reinforcing what the pattern says, but the pattern is written correctly. This is what I get for ambitiously trying to jump ahead, not reviewing the pattern and stitches carefully, starting a new pattern stitch in a busy social environment, and in general NOT paying enough attention! So here’s the moral of this story, even though it’s common sense and I really, really ought to know this by now: read all pattern instructions carefully and really pay attention to the instructions while you are setting up a knit. And let’s hope that the knitting gods aren’t inclined to smite cocky, hasty underachievers any more than they seem to be inclined to smite those unhumble perfectionists.